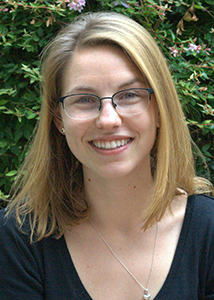 Allie Greenplate joined the Irish lab at Vanderbilt in 2013 for her Ph.D. thesis research in the Program in Microbiology & Immunology. Her project focuses on cancer immunotherapy and immune cell signaling. See a video of Allie from Association of Immunology (AAI) 2017 story booth. Allie is in the Vanderbilt Microbiology & Immunology Ph.D. training program. Allie’s training is supported by NIH/NCI F31 CA199993. ► This peer-reviewed research study described a case report where systems immune monitoring with mass cytometry revealed unexpected emergence of malignant myelodysplastic syndrome blast cells in the blood of a melanoma patient. The multidimensional mass cytometry panel enabled the blasts to be characterized in detail without analysis of a new sample by mining the existing data. Greenplate AR, Johnson DB, Ferrell PB, Irish JM. Systems immune monitoring in cancer therapy. European Journal of Cancer PMC4885747. Pubmed. DOI. 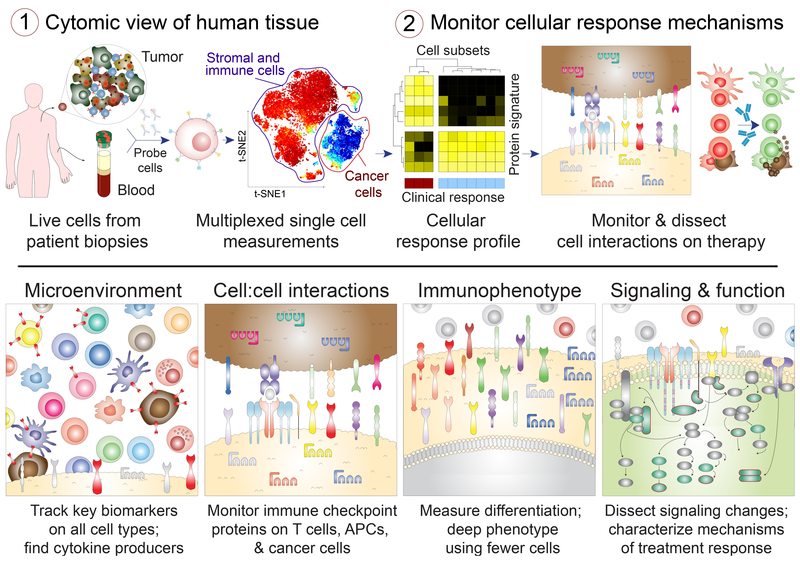 ► This peer-reviewed review described the clinical cancer research advantages of combining systems immunology and human immune monitoring approaches using mass cytometry and machine learning. Diggins KE, Greenplate AR, Leelatian N, Wogsland CE, Irish JM. Characterizing cell subsets in heterogeneous tissues using marker enrichment modeling. Nature Methods PMC5330853. Pubmed. DOI. Leelatian N, Doxie DB, Greenplate AR, Sinnaeve J, Ihrie RA*, Irish JM*. Preparing Viable Single Cells from Human Tissue and Tumors for Cytomic Analysis. Current Protocols in Molecular Biology 2017 Apr 3;118:25C.1.1-25C.1.23. PMC5518778. Pubmed. DOI. 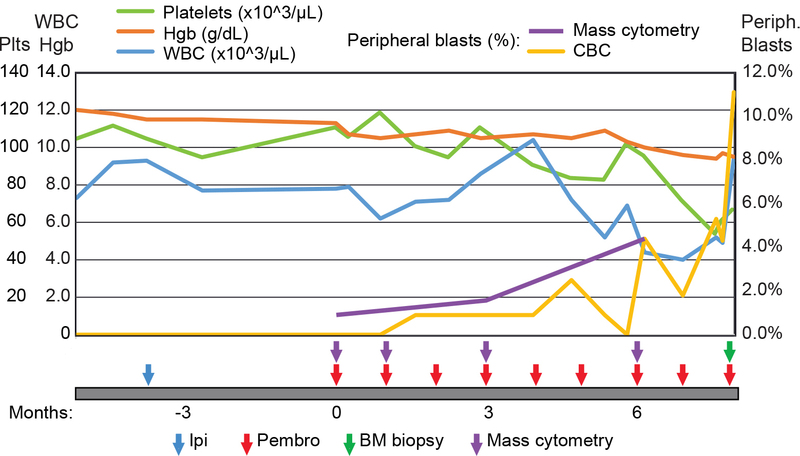 Wogsland CE, Greenplate AR, Kolstad A, Myklebust JH, Irish JM, Huse K. Mass Cytometry of Follicular Lymphoma Tumors Reveals Intrinsic Heterogeneity in Proteins Including HLA‐DR and a Deficit in Nonmalignant Plasmablast and Germinal Center B‐Cell Populations. Cytometry B 2017 Jan; 92(1):79-87. PMC5506779. Pubmed. DOI. Siska PJ, Beckermann KE, Mason FM, Andrejeva G, Greenplate AR, Sendor AB, Chiang YJ, Corona AL, Gemta AF, Vincent BG, Wang RC, Kim B, Hong J, Chen C, Bullock TN, Irish JM, Rathmell WK, Rathmell JC. Mitochondrial dysregulation and glycolytic insufficiency functionally impair CD8 T cells infiltrating human renal cell carcinoma. JCI Insight PMC5470888. Pubmed. DOI. Leelatian N*, Doxie DB*, Greenplate AR, Lehman JM, Sinnaeve J, Mobley BC, Kauffmann RM, Werkhaven JA, Mistry AM, Weaver KD, Thompson RC, Massion PP, Hooks MA, Kelley MC, Chambless LB, Ihrie RA, Irish JM. Single cell analysis of human tissues and solid tumors with mass cytometry. Cytometry B. PMC5459378. Pubmed. DOI. Johnson DB, Estrada MV, Salgado R, Sanchez V, Doxie DB, Opalenik SR, Johnson AS, Greenplate AR, Sanders ME, Lovly CM, Frederick DT, Kelley MC, Irish JM, Shyr Y, Sullivan RJ, Puzanov I, Sosman JA, Balko JM. Melanoma-specific MHC-II expression represents a tumour-autonomous phenotype and predicts response to anti-PD-1/PD-L1 therapy. Nature Communications PMC4740184. Pubmed. DOI. Nicholas KJ, Greenplate AR, Flaherty DK, Matlock BK, San Juan J, Smith RM, Irish JM, Kalams SA. Multiparameter analysis of stimulated human peripheral blood mononuclear cells: A comparison of mass and fluorescence cytometry. Cytometry PMC4808335. Pubmed. DOI. Roussel M, Greenplate AG, Irish JM. Dissecting complex cellular systems with high dimensional single cell mass cytometry. Human Innate Immunity. Experimental Approaches for the Investigation of Innate Immunity 2016. DOI.